These resources provide information on organic certification, organic sourcing, and additional labeling options. Organic Food Production Act: Details of the OFPA legislation from the Agricultural Marketing Service. Organic Certification History: Learn more about the history of organics and the creation of the certification from the Kerr Center. NOP Final Rule: Peruse the most up-to-date NOP Final Rule in the Federal Register. NOP Short Guide: The NOP has an 8-page document called “Five Steps to Organic Certification” outlining overall procedures. NOP Certifying Agents List: The NOP lists all certifying agents who have recently certified in your state. ATTRA Documentation Forms: ATTRA’s “Organic Market Farm Documentation Forms” offers a comprehensive list of templates. North Carolina State University Cooperative Extension: NCSU has empty templates in Microsoft Word that can be downloaded and modified to fit your operation, as well as samples already filled in to give you an idea of how to use them. Rodale System Plans: Rodale’s electronic Organic System Plan allows you to fill out your own plan online. AOSCA Organic Seed Finder: A searchable database listing organic seeds by crop, variety, and the seed company offering them. Family Farmers Seed Cooperative: Oregon. New initiative. Limited selection, but should be supported. Fedco Seeds: Maine. Good selection of organic seeds. FindOrganicSeed.ca: The seed directory of the Canadian Organic Growers. Harris Seeds: New York. Limited selection of organic seeds. High Mowing Seeds: Vermont. All organic seed company. Their catalog is a must for all organic growers. Johnny’s Selected Seeds: Maine. A great selection of organic seed. Morgan County Seed: Missouri. Some organic seeds. Good prices. Osborne Seed Company: Washington. Good selection of organic seeds. Seed Savers Exchange: Iowa. Good selection of organic OP and heirloom seeds. Small quantities. Seeds of Change: California. All organic seed company. Limited quantities. Seeds of Italy: Kansas-distributor. Some organic seeds. Small quantities. Seedway: New York. Limited organic varieties, but those they have are good. Southern Exposure Seed Exchange: Virginia. Good selection of organic OP varieties. Territorial Seed Company: Oregon. Limited selection of organic varieties. American Organic: Illinois. Good selection. Fedco Seeds: Maine. Good selection. High Mowing Seeds: Vermont. Limited selection of cover crop seeds. Johnny’s Selected Seeds: Maine. Some organic seed. Lakeview Organic Grain: New York. Good selection, and good prices. Peaceful Valley: California. Some organic seed. Seven Springs Farm: Virginia. Good selection, and good prices. Welter Seed and Honey: Iowa. Great selection of organic seeds. Excellent prices. New Sprout Organic Farms: North Carolina. Good selection of organic potatoes. Wood Prairie Farm: Maine. Great selection of organic potatoes. Irish Eyes Garden Seeds: Washington. Good selection of organic potatoes and garlic. Maine Potato Lady: Maine. Great selection of organic potatoes and garlic. Good prices. If a product has the OMRI seal (Organic Materials Review Institute), it has been reviewed and approved for use by certified organic farms following the NOP standards (though not all products permitted for use by the NOP will have an OMRI seal. If in doubt about an input, always ask your certifier). OMRI maintains a database of all OMRI approved substances. If you know what you want to use but don’t know if it is approved, your best bet is to sort through the products, suppliers, and/or categories of inputs. Download the complete OMRI list here. Arbico Organics: Arizona. Good selection of organic growing supplies. Johnny’s Seeds: Maine. Limited selection. OrganicInputs.ca: Canada’s national directory for organic inputs. Peacefully Valley: California. Great selection. Seven Springs Farm: Virginia. Good selection. “Food Justice Certified”: Addresses social issues through the Agricultural Justice Project. “Certified Naturally Grown“: Offers peer-reviewed certification based on the NOP standards. “Demeter Certified Biodynamic”: Can do your NOP certification at the same time for no extra charge. “Food Alliance Certification”: Looks at social and environmental sustainability standards, but may not be as strict as the NOP with regards to product applications. “Certified Wildlife Habitat”: Signs are available for a fee through the National Wildlife Federation for voluntary efforts to foster habitat. “United Farm Workers”: Provides a label for farms whose workers are under UFW contract (only available in California). 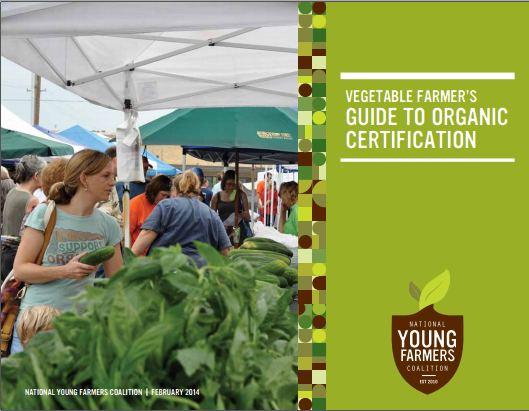 Vegetable Farmer’s Guide to Organic Certification: a guidebook to demystify and encourage organic certification for beginning farmers.